THIS WEEK! We Start the KARAOKE SING OFF! THIS WEEK! We Start the KARAOKE SING OFF! 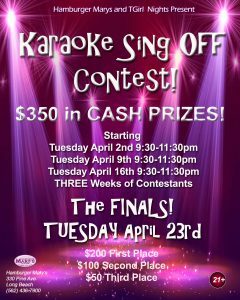 Three Weeks of Qualifying for THE Finals on April 23rd for $350 in CASH PRIZES! This is a HUGE event with FOUR Judges placing 8 contestants each week! Big audience participation too! Bring your friends to cheer you on and have a BLAST!